Duane Linklater’s In Perpetuity was a monument to Lenape Chief Tamanend and a historical reference point for the broad erasure of the presence of Indigenous peoples from lands that now include the city of Philadelphia. 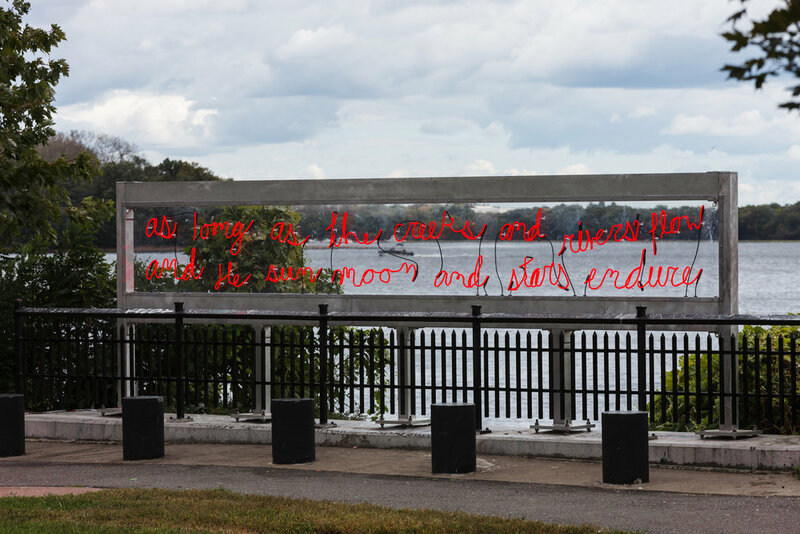 The artwork was installed on the banks of the Delaware River, in an area known as Shackamaxon, which served as a meeting place for thousands of years prior to colonial encounter. In 1682–83, William Penn and Chief Tamanend met there to secure a “treaty of friendship.” The scope of the Lenape’s agreement, according to historical accounts, was meant to last “as long as the rivers and creeks flow, and the sun, moon, and stars shine.” Linklater asked his nine-year-old daughter, Sassa, to handwrite these words. 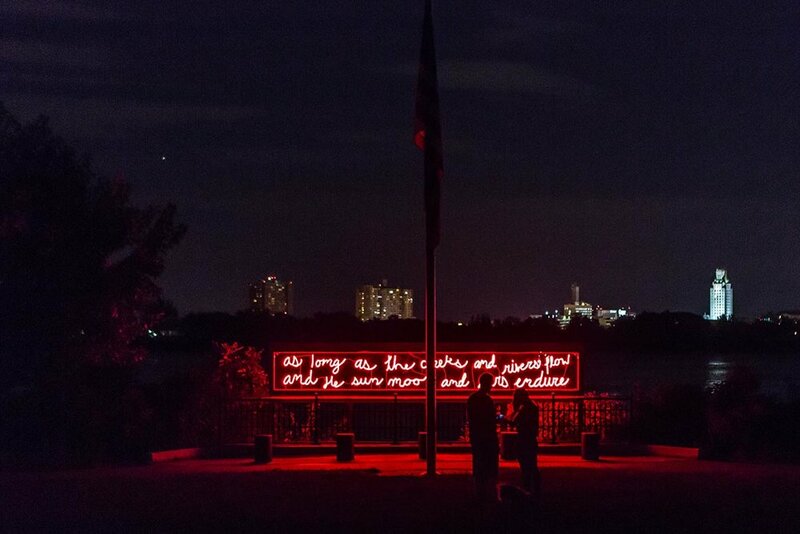 He then worked with a Philadelphia-area neon fabricator to reproduce the phrase as a lit sign installed on the edge of the park, to mark the enduring legacy of the Lenape people and the unraveling of a treaty intended to promote long-standing coexistence. Partners: Mural Arts Philadelphia, Philadelphia Parks & Recreation and Friends of Penn Treaty Park. In Perpetuity was presented as a part of the Monument Lab: Philadelphia (2017) exhibition. The birth of Philadelphia as a city was negotiated by two groups of people: the original inhabitants of the area, the Lenni Lenape people—who have lived in the area for thousands of years—and the new settlers from Europe. Upon meeting in what is now known as Penn Treaty Park in Philadelphia, both groups negotiated a treaty to articulate their relationships and responsibilities to each other and to solidify their peaceful co-existence in perpetuity. The actual meeting between Lenni Lenape Chief Tamanend and his counterpart William Penn was not documented in 1683, but is well-situated in the history or Philadelphia—preserved in paintings, monuments, park spaces, remnants of the tree which they sat under, and various writings. 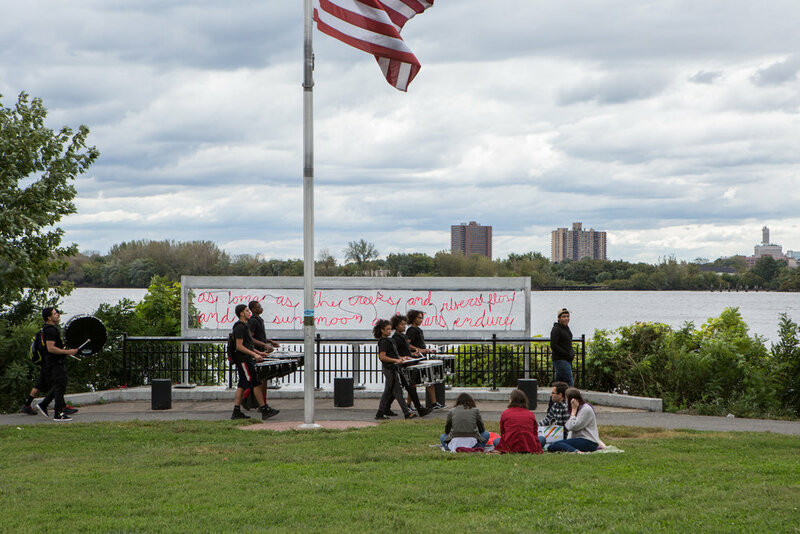 A translation of Tamanend’s words, which would have been spoken in the Lenni Lenape language, are now proposed in Penn Treaty Park in near proximity to the Delaware River. These words were given to the artist’s nine-year-old daughter, Sassa Linklater, to rewrite by hand as a kind of family pedagogy, a passing of Indigenous knowledge from one generation to another, a transmission of Tamanend’s poetry from one generation to another. 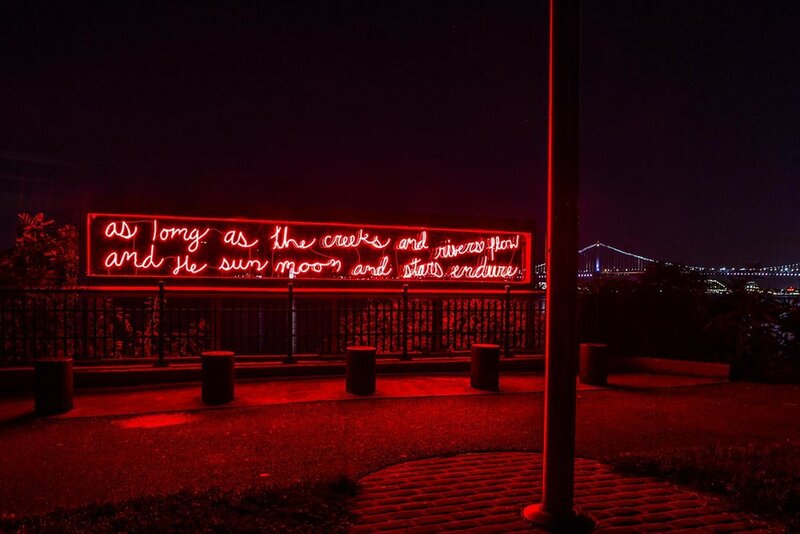 Held up in an aluminum structure housing the illuminated red neon words, in tandem with Bob Haozous’ Indian Land Commemorative (1988), both works articulate Indigenous conceptions of time and duration, the presence of Indigenous people in contemporary Philadelphia and the United States, and the original agreements which still hold so much potential. Duane Linklater is Omaskêko Cree, from Moose Cree First Nation in Northern Ontario, and is currently based in North Bay, Ontario. Duane attended the Milton Avery Graduate School of Arts at Bard College in upstate New York, USA, completing his Master of Fine Arts in Film and Video. He has exhibited his work nationally and internationally at the Vancouver Art Gallery, Family Business Gallery in New York City, Te Tuhi Centre for Arts Auckland, New Zealand, City Arts Centre in Edinburgh Scotland, Institute of Contemporary Arts Philadelphia, Utah Museum of Fine Arts in Salt Lake City and more recently at the the SeMa Biennale in Seoul and at 80WSE Gallery in New York City. His collaborative film project with Brian Jungen, Modest Livelihood, was originally presented at the Walter Phillips Gallery at The Banff Centre as a part of dOCUMENTA (13) with subsequent exhibitions of this work at the Logan Centre Gallery at the University of Chicago and the Art Gallery of Ontario. Duane was also the recipient of the 2013 Sobey Art Award, an annual prize given to an artist under 40. Duane is currently Duane is currently represented by Catriona Jeffries, Vancouver.